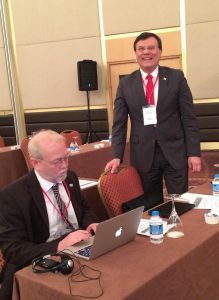 As representatives of the European Association of Institutes for Vocational Training (EVBB) Thiemo Fojkar, President of EVBB and Horst Dreimann, Secretary General of EVBB together with Tarik Bitlis, Managing Director of the IB affiliate IBETH, were participating in the 19th Eurasian Economic Summit with among others several presidents from central and South-Eastern Europe in Istanbul. The conference was scheduled from 5th to 7th April. Besides the topics economy and energy, the focus was on the topic migration and terrorism. In this context, President Fojkar held a speech on the topic of terrorism and migration. “The aim of our Association in collaboration with our European educational and VET institutions, who are our members and support it, is to establish career options for refugees in Turkey. For this purpose, the EVBB will carry out a major conference in Antalya at the end of September as a kick-off for the establishment of VET programmes including day care proposals for refugees from Syria in Turkey. Hence we sustainably pool our competences including many educational organisations from different EU member states to realise opportunities for vocational education and training for refugees. By implementing this initiative, we are creating perspectives for the people suffering from terrorism and war and to create opportunities once peace has reached Syria so that most refugees can return to their home country and actively participate in the reconstruction of their country. Motivation is our driving force and we hope there will be peace in this region very soon so that those suffering most from this war can go back with dignity. Next to other duties we herewith fulfil our political responsibility as a European organisation.” Thiemo Fojkar said.